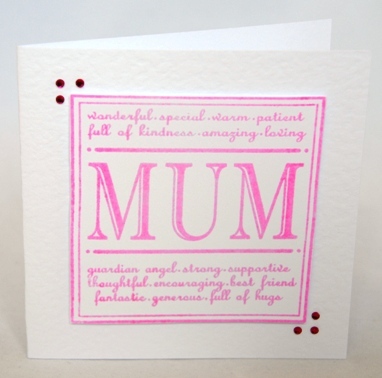 This simple design shows the word MUM surrounded by the words to describe her – wonderful, loving, encouraging, amazing, generous and many others. These are embossed in pink and set on 3D pads to make it stand proud of the card. It is also embellished with three tiny pink acrylic gemstones on the top left and bottom right hand corners. The card is blank inside for your own special message. I made the card with Mothers Day in mind but it could just as easily be used for a birthday. If ordering by phone, please reference card #487.